This rectangular table came from Piedmont, located just off State Route 51 about a mile and a half west of Charles Town, WV. The piece is identified as a “birthing table” because newborns at Piedmont received their first baths on the table. This rectangular table came from Piedmont, located just off State Route 51 about a mile and a half west of Charles Town, WV. The property was originally owned by Robert Worthington who built a small stone dwelling on the property around 1735. Dr. John Briscoe acquired the property in 1786 and shortly thereafter built the stately Georgian style brick dwelling that was occupied by Briscoe family members until the death of Miss Louise C. Briscoe in 1979. The piece is identified as a “birthing table” because newborns at Piedmont received their first baths on the table. 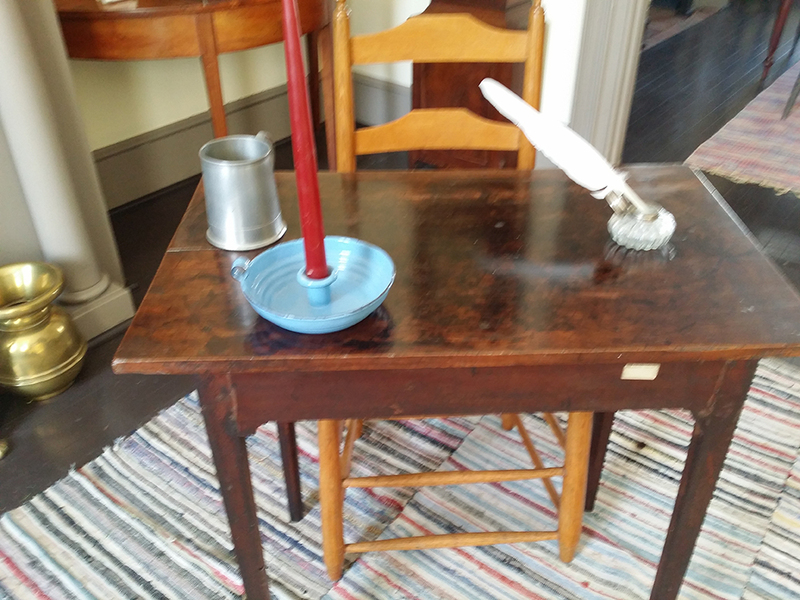 The table top and rails are solid cherry; the legs appear to be cherry as well but the old finish makes positive identification almost impossible. The table top is secured to the frame with chamfered glue blocks, some of which are missing and some of which are replacements. Filled holes in the top indicate it may at one time been further secured to the frame with nails The side and end rails are mortised to the legs. The legs are very gently tapered and are chamfered on the center-facing corners. Overall dimensions are: Height – 28 3/4 inches; Width – 28 3/4 inches; Depth – 17 5/8 inches.